Grace Fulton has been confermed to be playing Mary Matson in the upcoming Shazam film. It's now rumored that Michelle North has been cast as her adult alter ego Mary Marvel. Last edit: 28 Apr 2018 18:01 by andyf. Replied by jmg88 on topic Mary Batson and Mary Marvel in Shazam? Replied by rednecko on topic Mary Batson and Mary Marvel in Shazam? I don't think we see the Captain Marvel family until a sequel. They want to keep it basic for the first film and see if it does well before they put more effects money. I kind of hope I love because Mary marvel is so badass. rednecko wrote: I don't think we see the Captain Marvel family until a sequel. They want to keep it basic for the first film and see if it does well before they put more effects money. I kind of hope I love because Mary marvel is so badass. Apparently the movie seem to be based on the "Curse of Shazam" storyline, the one that introduced Cap in the New-52 universe. Given that Mary played a pretty significant role in that comic things might shape up differently. Replied by thedoc9 on topic Mary Batson and Mary Marvel in Shazam? I remember when I read the story that revealed that when Mary and Billy both use the power at the same time, their respective strength is cut in half. This seemed to be a really nice way of introducing a “weakness/vulnerability” to the heroes. I’d love to see the movie exploit this concept in some way. Like many folks here, I suspect, my interest in the Shazam movie ramps up greatly with Mary’s presence. Replied by shevek on topic Mary Batson and Mary Marvel in Shazam? thedoc9 - You're damn right it does! However, I'm not seeing anything yet about Michelle Borth on the film's Wikipedia page, nor a list of the Mary Marvel on Michelle's own Wikipedia page either. But if indeed the Mary Bromfield/Batson character will consist of Grace Fulton as the teenage/geeky secret identity and Michelle Borth as the shapely adult heroine filling in a gorgeous Mary Marvel costume, count me in 100% for that transformation scene!! I figured that they might introduce Mary Batson in the first movie and power her up to Mary Marvel in the second if it's a hit. And if they are going to do the same thing as Billy - teenager to adult - that would be great. That's definitely my favorite interpretation of the character. prisons, requiring Billy to share his power with the other kids. Last edit: 25 Mar 2019 03:00 by murdough. andyf wrote: Grace Fulton has been confermed (sic) to be playing Mary atson in the upcoming Shazam film. 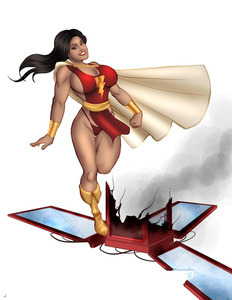 It's now rumored that Michelle North has been cast as her adult alter ego Mary Marvel. Interesting tidbit: The actress for the adult alter ego (Michelle Borth @ 5'6"... 168cm) is an inch shorter that Grace Fulton (5'7"... 170cm).. Replied by fats on topic Mary Batson and Mary Marvel in Shazam? The casting choices are interesting. Last edit: 29 Mar 2019 13:34 by shadar. It depends on which version of Mary are you considering. This movie seems to be mostly based on Geoff Jones's Curse of Shazam storyline, where Mary was much older than Billy and they were not related. Curse Mary was the "Wendy Darling" of the Broomsfield family and the only biological daughter of Mr and Mrs Broomsfield, whereas all the other siblings (including Billy and Freddy) were adopted. When she got powered up in the climatic battle at the end of the story she's the only one to keep a relatively unchanged appearence, aging only slightly, while most of her siblings went from pre-teen to adolescent or adults. Replied by jdrock24 on topic Mary Batson and Mary Marvel in Shazam? Saw a preview showing and yes, all the adopted siblings,including Mary, do indeed gain superpowers and make an appearance. Most of them get some action sequences but Mary only got one that I can remember. Darla got more than her. Hopefully they make a sequel where Mary gets to show off more. Replied by Random321 on topic Mary Batson and Mary Marvel in Shazam? They might be thinking long term too ~ how will each age into the roles if they become sequel/spinoff worthy. Then again, maybe I'm giving too much credit to the long term thinking of Hollywood? Woodclaw wrote: This movie seems to be mostly based on Geoff Jones's Curse of Shazam storyline, where Mary was much older than Billy and they were not related. Curse Mary was the "Wendy Darling" of the Broomsfield family and the only biological daughter of Mr and Mrs Broomsfield, whereas all the other siblings (including Billy and Freddy) were adopted. When she got powered up in the climatic battle at the end of the story she's the only one to keep a relatively unchanged appearence, aging only slightly, while most of her siblings went from pre-teen to adolescent or adults. I don't entirely agree with this. While "Curse" Mary is indeed the oldest of the orphans and the one who changes the least when she transforms, she is hardly relatively unchanged. She ages quite a bit. Either way, I am glad they are using the cool new extended Shazam family for the finale. Last edit: 29 Mar 2019 16:35 by Agent00Soul. Hmmm... doesn't sound nearly as interesting now as I'd hoped. I was thinking comic book Mary Marvel from the 70's and 80's, which portrayed her as a Supergirl-grade character who transformed between a tall, built, 20ish costumed superwoman and a rather frail early teens girl. They were showing a ten (probably more) age difference between her two identities. That opened up some comedic elements as well as some themes of changing one's age from innocent to mature that had to be delicately handled for a G-rated comic. Just shows how much characters change over the decades. I think I'll sit on the sidelines on this one until I see how it develops. Hopes high but expectations low. shadar wrote: I was thinking comic book Mary Marvel from the 70's and 80's, which portrayed her as a Supergirl-grade character who transformed between a tall, built, 20ish costumed superwoman and a rather frail early teens girl. They were showing a ten (probably more) age difference between her two identities. 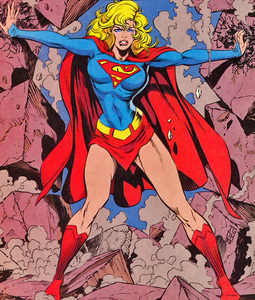 It's possible that with television's Supergirl so well-established at this point, the producers of the movie didn't want to be accused of simply doing a brunette Kara, which is basically what Mary Marvel was in the 70s and 80s. DC even used this as a plot device: they teamed up and/or were rivals many times in the comics during those years. Hence her look in the film and why they concentrate more on Darla. Even with the main character, the original Cap was so similar to Superman that DC basically sued Fawcett out of business. To avoid confusion this time, I'm guessing, they made Zazhary Levi's costume much more exaggeratedly big and muscular - more like a comic book - than Henry Cavill's Superman outfit. I have high hopes for Levi by the way - he was very funny in The Marvellous Mrs. Maisel. All true, for some reason in other pictures she looked much older, especially when she scolded Billy.